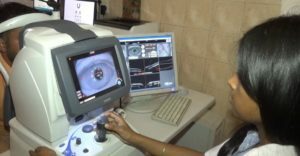 Retina treatment in Noble Eye Care gurgaon offers the latest equipment whether for diagnosis or laser procedures or Vitreo-retinal surgery. Cutting edge diagnostic technology in the form of high resolution OCT or therapeutic modalities such as retinal laser and vitrectomy machines, reflect our focus on highest priority to visual outcome and patients comfort. The retina service helps manage patients with diabetic retinopathy, hypertensive retinopathy, retinal detachment, vascular occlusions, and retinopathy of prematurity among many other conditions.